With its pleasing driving characteristics, comfortable interior, fantastic tech features, comfortable interior and legendary reputation for reliability, its easy to see why the Camry has been the best selling car in the United States for the past 13 years. And for the 2016 model year, Toyota is infusing this iconic car with a high degree of exclusiveness and sophistication with the Camry Special Edition. With such stylish features as unique 18-inch alloy wheels, blue ornamentation and stitching and a Special Edition exterior badge, the 2016 Toyota Camry Special Edition in Tuscaloosa AL gives you a ride that certainly sets you apart from the mid-size sedan pack. The Camry Special Edition builds upon the stylish exterior update of the 2015 Camry. It has new body panels as well was two vibrant paint colors: Blizzard Pearl and Blue Streak Metallic. Additionally on the Special Edition, you'll find 18-inch alloy wheels that are made of a lightweight alloy and feature a machined face accented by glossy black paint. Also, the taillights are changed, with a smoked exterior housing that goes very well with the new paint colors. The Camry Special Edition possesses many unique and stylish features, including 18-inch alloy wheels with gloss black accents and blue seat inserts and blue contrast stitching, and blue meter cluster and ornamentation and Special Edition exterior badge. Since the production of the Special Edition is limited to only 12,000 units, it gives you the opportunity to realize all of the traditional attributes of the popular Camry, but with very exclusive design elements and features. The drivetrain for the Camry Special Edition is a 2.5-liter four-cylinder engine with a six-speed automatic transmission. The engine produces 178 horsepower and 170 lb-ft of torque, boasts a 0-to-60 mph time of eight seconds, and delivers a top speed of 125 mph. The exclusive stylishness extends to the interior of the Camry Special Edition as well. It includes such exquisite features as satin chrome accents, wood trim and leather upholstery, and the Special Edition adds to this with an abundance of additional features. The seats enhance its sporty feel and appearance with black SofTex lateral supports, including blue patterned inserts and contrasting blue stitching. Additional features include a standard power tilt/slide moonroof, a sleek blue/white gauge cluster, keyless entry, the excellent Entune Premium Audio sound system and Qi Wireless Charging. The 2016 Toyota Camry Special Edition is a very pleasing addition to the Camry lineup, especially with its stunning appearance and many stylish features. Since the production of the Special Edition is limited to only 12,000 units, it gives you the opportunity to realize all of the traditional attributes of the popular Camry, but with very exclusive design elements and features. If you're interested in taking the 2016 Camry Special Edition for a test drive, then don't hesitate to contact us here at Tuscaloosa Toyota. Also, be sure to check out our no-cost non-factory Lifetime Warranty, which extends the standard Powertrain Warranty for any new Toyota model. 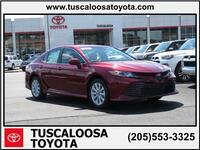 Interested in a 2016 Toyota Camry?